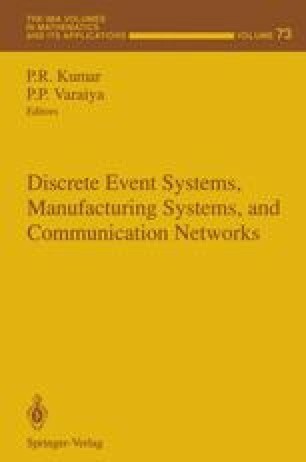 Dynamic set-up scheduling is an important issue when a Flexible Manufacturing System (FMS) recovers from a failure or other disruption induced excursion from its economic-lot size steady state cycle. In fact, FMSs usually spend more time recovering from disruptions than being in steady state. We present recent results on the structure of optimal and near optimal policies for dynamic set-up scheduling that minimize backlog costs for a given vector of demands for each of many part types. When different part-types are nonhomogeneous or differ significantly in importance or value, non-Round Robin (general Round Robin) set-up change policies may be needed. Theoretical considerations and numerical solution results are used to deduce structural properties of the optimal policies (not necessarily Round Robin) and design near optimal policies that are tractable for high dimensional systems. The near optimal policies are based on primary and secondary set-up change hyper plane surfaces (thresholds). Primary switching surfaces (PSSs) are of dimension n — 1 (for n part-type systems) and when encountered indicate that the current set-up must be changed. Secondary switching surfaces (SSSs) are of lower dimension and indicate what set-up to change to. Stability issues as well as issues on convergence to a limit cycle are raised and analyzed, and sufficient conditions are obtained. A procedure for designing primary and secondary hyper plane set-up switching surfaces is proposed and implemented. Research reported here has been supported by NSF grant DDM-9205368.